GreenEcoSupply by GreenEcoSavers is a one-stop source for green, eco-friendly, smart, energy & water conservation products and energy solutions. We offer quality green products at competitive prices with energy savings calculators, valuable information resources and provide a full range of energy consulting services. Our mission is to promote energy efficiency and help to reduce the effects of global warming. Everyone wants to be green but, with so many choices for products, consumers are often lost and don’t do anything at all. This is where we come in - along with quality products at competitive prices, we provide savings calculators, resources and a wealth of information on our website to help consumers select the right products based on their needs and see how they can be green, eco-friendly and at the same time save money. We show a Return on Investment (ROI) analysis for our featured products so that consumers can see that being green is not only good for our planet earth and the environment but also pays back. GreenEcoSavers, LLC provides a full range of energy consulting services including commercial building energy audits; sustainability planning, carbon audits, whole building energy simulation and modeling services using DOE-2 based programs like eQUEST and BIN based energy modeling tools; utility data entry, analysis and bill validation services; energy benchmarking including ENERGY STAR building labels; technical review services for Energy Savings Performance Contracting (ESPC) projects; commissioning and retro-commissioning for existing buildings; Measurement and Verification (M&V); renewable energy project development including feasibility analysis and design of solar photovoltaic (PV), solar thermal and wind power projects; renewable energy product procurement and LEED consulting services. GreenEcoSavers, LLC is an Authorized Dealer for AEE Solar, DC Power Systems, SunWize and Focused Energy. Through these distributors, we offer a full line of renewable energy products including solar photovoltaic (PV), solar thermal and wind power products from Sharp, SANYO, REC, SolarWorld, Mitsubishi Electric, Kyocera, Evergreen Solar, Uni-Solar, Kaneka, Suntech, Yingli Solar, Unirac, OutBack Power Systems, PV Powered, Xantrex, Southwest Windpower, SMA America/Sunny Boy, Fronius International, Enphase Energy, SatCon, MidNite Solar, Wattsun, Fat Spaniel Technologies and many more. GreenEcoSavers, LLC is proud to offer our customers products with the ENERGY STAR label.We are committed to continually improving our management of energy resources, which reduces both operating costs and related forms of pollution. 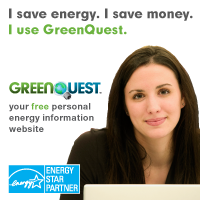 We are proud to be part of the family of businesses who have also joined with ENERGY STAR. One way they do this is to help responsible consumers and green businesses find each other in the marketplace. Businesses displaying the Green America Seal of Approval have successfully completed Green America's screening process and have been approved to be listed as a socially and environmentally responsible —or green—businesses in their National Green Pages directory. As a consumer, you can feel confident that business bearing this seal operate in ways that support workers, communities, and protect the environment. The word “Green” is used synonymously with Sustainability and has a range of meanings from energy conservation, water conservation, recycling, eco-friendly materials for all applications. It has to do with considering the entire life-cycle of any product from cradle to grave and ensuring that the entire process has the least negative effect on the environment. We specialize in energy and water conservation products and when we choose energy saving products which are Green products as described above, we choose the ones that meet the following criteria: low energy consumption, long life, easy and safe to recycle and proven track record of the manufacturer of the product. All of our suppliers are based in the USA and some of the products that we source from them are manufactured in other countries. We carefully screen all of our products to ensure quality, energy savings potential and UL listings, which are required by all local, county and state regulations for safe installation of products. We review our vendors policies related to sustainability, environmental stewardship, fair labor practices and other important criteria along with keeping track of their performance. We want to ensure that our customers get the absolute best in terms of quality of the product, energy savings potential, low life-cycle, background of the manufacturer and their environmental stewardship profile. GreenEcoSavers, LLC is a BBB accredited business. BBB has determined that GreenEcoSavers, LLC meets BBB accreditation standards, which include a commitment to make a good faith effort to resolve any consumer complaints. BBB Accredited Businesses pay a fee for accreditation review/monitoring and for support of BBB services to the public. GreenEcoSavers, LLC is a Dun & Bradstreet (D&B) Registered business. D&B maintains a report on our business, which includes business information validated by the business as well as information from third party sources. D&B is the world's leading source of commercial information and insight on businesses.